UPDATE: The WPP boss is used to shareholder revolts over his salary - but Sorrell says it's all justifiable because he's worth it. Advertising magnate Martin Sorrell may well be feeling a bit indignant, all things considered. WPP has just reported a 5.1% rise in quarterly revenues to £3.1bn, compared to last year. His company’s performance isn’t in question. And yet he’s getting roped back into the executive pay debate following the furore over BP’s Bob Dudley, who received a 20% pay rise for the year his firm suffered its worst annual loss, resulting in a shareholder rebellion. Of course, Dudley’s pay package of £14m pales in comparison to Sorrell’s – which’ll be up to £70m (much of it consisting of a £62.8m long-term bonus). The bonus takes his total earnings to somewhere in the region of £150m in just five years. Throw in the fact the High Pay Centre found that the average FTSE 100 chief exec makes 183 times the average full-time worker’s pay and it’s not hard to see why executive pay remains such a contentious flashpoint. But as Sorrell reiterated on the BBC Radio 4’s Today programme, his pay is clearly tied to the performance of WPP. ‘I’m not embarrassed about the growth of the company from two people in one room in Lincoln’s Inn Fields in 1985 to 190,000 people in 112 countries and a leadership position in our industry, which I think is important,’ he said. So there. The debate surrounding exec pay may be getting fiercer, but Sorrell’s been here before and fended off disgruntled shareholders. 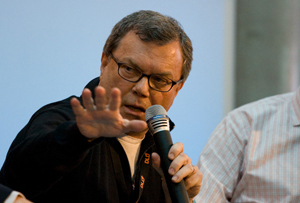 Of course, Sorrell is also a special case in that he’s the founder as well as the CEO of WPP, one of the UK's best known and most successful companies. When he talks, people listen. Whether it’s his gloomy warning on the state of the global market or ruminating on why gap years are a waste of time (teenagers take note if you’re after your own £60m pay package). Yes, he does still treat the company as if it’s his own (which really it’s not as it’s a listed firm). Sir Martin might be running it on behalf of shareholders, but from his perspective there’s only one person in the driver’s seat. And the fact remains that with profits in 2015 of £1.5bn - WPP's fifth year of record results - he's delivering the goods. There are no rewards for failure here. It’s still a highly controversial sum – and the fact that his pay seems to keep on rising suggests we may be in for a few more shareholder revolts yet. But really it’s unrealistic to expect shareholders to do much about reining in executive pay when times are good – they only care once something has gone awry. Compared to that £1.5bn pre- tax profit he's delivering for them, £60m doesn't seem quite such a stellar amount. Executive pay is hugely distorted – Oxfam has just claimed that more than a quarter of the wealth created in Britain over the past 15 years has ended up in the pockets of the richest 1% of people. But working out how to do something about it without turning off the wealth taps altogether is a much trickier problem.